We characterize our products across all specification ranges including environment, immersion, and surface adhesion. We measure the performance using equipment specifically designed in conjunction with local universities and our own application experts. Characterization testing is performed in the new product development cycle. When a product transitions into production, product and processes are both monitored for consistency with regular in line testing. Test results are monitored by our process engineers using standard statistical process control methods for determining sample size and test frequency. 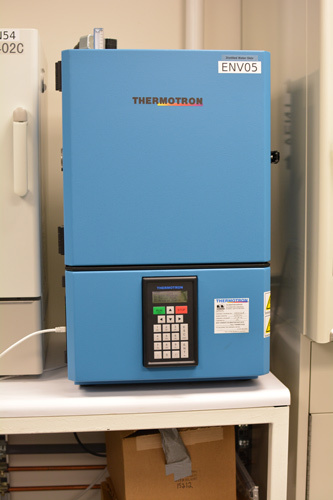 Parts are cycled in an environment chamber from 60°C to -40°C at 85% relative humidity for 4 hours per cycle. After 50 cycles, the parts are held at 21°C, and 0% relative humidity for 98 hours. Parts are tested for adhesion using a specific adhesive film which is adhered to the surface and then removed at a constant rate. Parts are exposed to 60°C at 90% relative humidity for 1,000 hours. Parts are inspected for visual anomalies and tested for transmission and reflection performance. Moxtek is a true leader on pixelated polarization filters. This technology has allowed us to create imaging sensors capable of intraoperative imaging of cancerous tissue for the first time. Moxtek has developed cutting edge UV polarizer products for us which have enabled us to create the best products in our market. Their development team members are great to work with and their manufacturing supports our new product introductions with on-time deliveries, and even expedited deliveries.